Former President Olusegun Obasanjo has accused the Buhari administration of plotting to slam false charges on him, to pave the way for his indefinite detention. The former leader said the government was planning to use fake documents and witnesses against him. Mr Obasanjo said this in a statement by his media aide, Kehinde Akinyemi, on Friday. 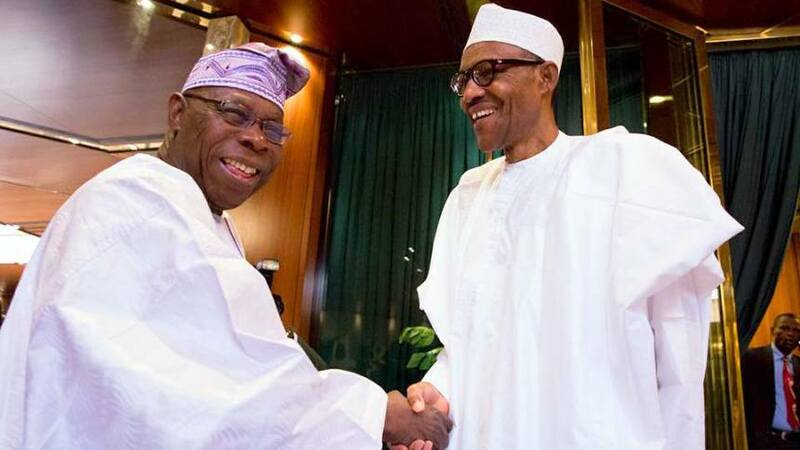 The claim is the latest twist after weeks of bitter exchanges between the two leaders, who fell apart after Mr Obasanjo accused Mr Buhari or ineptitude and corruption, and advised him not to seek reelection. Mr Buhari responded recently by accusing his predecessor of frittering away $16 billion on phoney electricity projects. Mr Obasanjo hit back at the “ignorant” claim. Speaking via his aide on Friday, the former president said plans to silence him were in two fold, among which is a plot to cause the Economic and Financial Crimes Commission (EFCC) to reopen investigation into the activities of his administration. He said the Buhari administration had also perfected a plan to use fake documents and witnesses against him. He said this will be a re-enactment of the Abacha era in which he ( Obasanjo) was detained on trumped up charges. The presidency could not be immediately reached for comments. The former president said he had been told that his name was on the government’s “watch list”, and that the security of his life cannot be guaranteed. He however said no amount of campaign of calumny, no matter how well contrived, orchestrated or marketed would deter him from speaking out. “Since Chief Olusegun Obasanjo declared in his State-of-the-Nation Special Statement on January 23, 2018, the desperation to frustrate, intimidate and blackmail him into abandoning his divine mandate to protect the rights of the people to better life and living continued unabated and has even taken a bizarre dimension,” the statement said. The statement said the first option to silence him was to seize his international passport and clamp him into detention indefinitely, in order to prevent him from further expressing angst on the “pervasive mediocrity in the quality of governance, economic management and in the protection of lives and property by the Government”. "Impeccable security sources have alleged Chief Obasanjo’s name is on their Watch List and that the security of his life cannot be guaranteed. According to these informants, many of who are in the top echelon of the Nation’s security management and close to the corridors of power, the operatives are daily perfecting how to curtail the personal liberties of the former President and hang a crime on him. "Ordinarily, we would not have dignified these reports with a response but for the fact that many of these informants are not known for flippant and frivolous talks. Secondly, this Government has demonstrably exhibited apathy, and in some cases, encouraged by its conduct, daily loss of lives and property in many States of the country, the office cannot be indifferent. “We are currently in a nation where the Number Three citizen is currently being harangued and the Number Four citizen is facing similar threat within the same Government they serve. There is a groundswell of our nationals that live in fear that they could be hounded, harassed, maimed or even killed as the battle for 2019 takes this worrisome dimension. “For Chief Obasanjo, this is a joke carried too far and being someone who do not act on unofficial information, he had cautioned all informants and adopted a wait-and-see attitude to the bestial propositions allegedly being contemplated to cow, cage and embarrass him. “The content of the alleged beastly designs, it was learnt are two-fold for now. One, to seize his International Passport and clamp him into detention indefinitely, in order to prevent him from further expressing angst on the pervasive mediocrity in the quality of governance, economic management and in the protection of lives and property by the Government. “But, since that could expose the Government to a swath of international condemnation, embarrassment and outrage, it is said that another plot being hatched is to cause the Economic and Financial Crimes Commission (EFCC) to re-open investigation into the activities of Chief Obasanjo’s administration using false witnesses and documents. This will be a re-enactment of the Abacha era in which Chief Obasanjo was one of the principal victims’. "The same EFCC that had conducted a clinical investigation on the activities of Obasanjo in and out of Government, it was said, would now be made to stand down the existing report that gave Chief Obasanjo a clean bill of health on the probes are now to get him indicted, fair or foul for possible prosecution and persecution like it is being done to real and perceived opponents, enemies and critics of this Government. "Dissent is a fundamental principle on which liberal democracy is predicated. A true democrat must be ready to live with and accommodate dissent and opposition. While it is regrettable how the Government has sunk in its shameless desperation to cow opposition, a resort to blackmail, despotism and Gestapo-tactics being employed by the goons of this Government would not hold water. And no government ever remains in power forever. "For the record, Chief Obasanjo reiterates his readiness to face probe again after that of the House of Representatives, the Senate, the ICPC, and the EFCC, but before an independent, objective and credible panel of enquiry to account for his stewardship in Government and beyond’. "Chief Obasanjo reiterates that he has taken a principled position to ensure that the ship of the Nigerian State does not capsize and he remains steadfast in his resolve to turn the tide of maladministration, poor economic management and rudderless governance model that has tore Nigerians apart on account of religion and ethnicity which is a great threat to our democracy’. "We would like the Government and its supporters to understand that no amount of campaign of calumny, no matter how well contrived, orchestrated or marketed would deter Chief Obasanjo from calling a spade by its name. Chief Obasanjo is a patriot whose sole agenda is to ensure that the country’s unity, progress and democracy are not negotiated on the altar of incompetence and provincialism and mediocrity. He is planning another similar crisis, so PMB be careful with that evil old man called as ' Ebora Owu'!